I have a favorite pair of shoes. They’re cold-weather hikers, originally waterproof but after a few years of use, not so much anymore. That’s not the problem, though, as apparently a tiny hole has appeared, somewhere, in the sole (where exactly, I haven’t been able to determine). However it lets enough water in that walking around on a rainy day or on wettish pavement soon leads to soaked and freezing toes. So now I’m pondering whether, if I can’t fix it myself, it’s worth having re-soled (assuming that’s possible). I’m the type of person who, when he finds a type of clothing or shoe that fits well, buys a back-up supply for the future. Same size, same color, yep, I’ll take five. Perhaps that reflects my disdain for clothes shopping as much as anything. So yes, I’d probably be willing to pay a fairly high ransom to get these winter walkers pavement-worthy again. Shoe repair is another one of those archaic-seeming professions that the 21st century has left in its rear-view mirror. The term “cobbler” brings to mind limericks and fairy tales faster than an active profession. I wonder if the younger generations even know what a cobbler is? I’m sure we can still find shoe repair places in English society, but I don’t think it will make anyone’s list of boom industries anytime soon. Not in a culture oriented towards tossing worn things away. I shot this photo in the Belleville, Ohio Amish community. Amish settlements often have shoe stores, and not too surprisingly, places where you can get your footwear patched up again. I think I have found a someone like myself! I found a pair of shoes I like – I have 4 pair on the go currently! And, yes, I had two of them repaired at a shoe repair shop (not Amish or Mennonite thought.) My father-in-law repaired shoes after he retired from farming, then his son took it up after him, and then my sister-in-law after her husband died. They repaired shoes for the Mennonite community, for police, and anyone else that came along. I have not frequented or even visited a “real” cobblers shop. I have been through the ones that show you how things “used to be done” when i was young, but *Shrug* that’s about it. Yes to both. There are actually two cobblers in New Orleans, and both have plenty of business.And I have hard-to-fit feet, and when I find a pair of shoes that fits, I buy a back-up pair, too! I, too, hate clothes shopping, or any kind of shopping. I have a top that fits well and I love it, so I have 10 of them, one in every color. I have 6 different colors of one shoe, and 4 of another, and two pair of house slippers of the same kind. You are not alone. If your clothes buying habits are weird, then there are others out there just lke you…..
My father grew up on a farm in southern Maryland around the time of WWI; 8 children, more or less lived off their land and not a lot of extra money. My grandfather would repair the children’s shoes until they were beyond wearable. Also I remember my father saying that leather was in short supply and shoes had cheap cardboard soles that would wear out very quickly and you didn’t dare get them wet. As always when given advice by the Amish, I did just that. Eric, there is nothing weird about you – if there is, then there are a lot of us weirdo’s raised by frugal parents out there. I was raised in the north and loved to visit the cobbler as a child. The smell of the shop and the wooden floor was a delight to the senses. I still frequent the Nu-Way Shoe Shop in Statesville, NC. Same wood floor and smells I remember as a kid. this buying several of the same shoe is something my daughter and best friend and I all do. To us it makes perfect sense. Keep writing- I so enjoy learning about your travels. I used to take shoes to the cobbler to be repaired as a child. We would take shoes to get new heels put on, or a strap to be fixed that the dog chewed on. My dad always got a pair of shoes re-soled to continued to wear them. This one cobbler was an old man and he had this little dog, that I used to love to sit and pet while waiting for a pair of shoes to be repaired. Dirty place, but still brings back memories. I still use a cobbler today. I will go get heels replaced, and sometimes get shoes stretched there. Never used an Amish cobbler though. Being prudent I have often had a pair of shoes or boots that I liked repaired for further use because they fit well. As an Englisher I also often buy multiples of T-shirts (I have several identical blue ones with a football logo on it), cargo pants once I find a brand that fits well and is functional and Wrangler’s jeans. I have tried having some other once good shoes resoled just to find out they were too broken in and worn down inside to furnish the identical life of a new shoe that I expected out of them. We use to have a shoe cobbler in our town, but he closed many years ago. Now if we need shoe or purse repair we have to go a couple of towns over. I feel by the time I wear a pair of shoes out-it’s time to get a new pair-but that’s just my feeling. I purchase Birkenstock shoes & boots & because they are so expensive I’ll take advantage of their lifelong repair policy. One pair I’ve worn 10 years & except for a little wear on the sole they’ve held up beautifully. They are the only shoe that supports my posture & helps eleviate fibromyalgia leg & back pain. In these times of wastefulness, purchasing a quality product & buying a quantity is just being a good steward of money…mind though, need the qty you buy. We have put new soles on many pairs of boots and shoes over the years, and we are also known for buying more of one kind of shirt, pants, (and even underwear), for future use, when we find something we really, really like. I was gonna take my barn boots and get a new sole put on. But i cant bring myself to make someone get that close to them. LOL They are barn boots and they smell like it! I guess I will buy new ones. Recently, I took 5 prs of various shoes and boots to an OO Amish saddle shop. He thought the glue he used on the leather components would work. My footwear to be repaired ranged from lace-up genuine leather men’s work boots to modern-day sneakers. His glue didn’t hold much at all. I ended up working on them myself using Gorilla Glue. It does expand and dries a yellow color which doesn’t accept shoe dye or polish. But, if filed some it will accept some color. On the one-piece soled sneakers, I ran a liberal bead of the glue all the way around on the inside where sole edge overlaps the upper. It expanded too much to file, so I used a bench grinder to remove the large amount of excess that came into view. Then, a quick shot of flat-black spray paint on that black rubber sole and they look and work as new. btw, I replace in-soles and strings as needed on my favorite prs. I was fortunate to have a mum who would try to repair anything we’d ripped or torn, and who recycled LONG before it was popular fashionable. She taught me well. I have also been blessed to have a cobbler available in most of both my childhood and in my adult life, and I so appreciate their skills. It is, indeed, a vanishing profession, along with watchmakers, movie theatre ushers, white-gloved elevator opoerators, neighborhood family-owner bakeries and butcher shops,and family shoestores where the owner/clerk REALLY KNEW how to fit you. My husband and I do miss these staples of our growing up years, and do take advantage of any opportunities to do business with these independent, fair-minded, wonderfully-skilled business folks. (Unfortunately,we don’t have ready access to an Amish community.) Thanks for the topic, Eric. It sparked lots of good memories of “the good ol’ days. I used to be hard on heels and took all my shoes to a cobbler to be re-heeled when they wore out. But times change. The shop I used to go to has closed and I am wearing more sneakers now that I am not working. I don’t think you’re shopping habits are weird. But I think that some of us have been forced into buying multiples of the same clothing by the short time that companies produce the same size/style/color. By next season the pants I like will no longer be available, the shirt will only come in orange and lime or the shoes will be discontinued. I don’t think your shopping habits are weird. But I think that some of us have been forced into buying multiples of the same clothing by the short time that companies produce the same size/style/color. By next season the pants I like will no longer be available, the shirt will only come in orange and lime or the shoes will be discontinued. I’ve had two pairs of work boots resoled and resewn a couple times apiece. There is a cobbler in Burlington, near here. I hate breaking in new work boots. If the shoe fits, repair it! Jackie, your comment about your barn shoes cracked me up! I can relate! TGD, your tips were also appreciated. I’ve used Gorilla Glue for other repairs, and will keep it in mind! Most every neighborhood still had shoe repair places in the early ’70’s. There’s still one in the town next to mine (suburbs), where I’ve taken a favorite pair of Mary Janes to have a strap sewn back on. I (not-so-jokingly) tell my co-workers that I’m ready to go to togas & sandals—much more comfortable & about where I’m at “fashion-wise” at this point in my life! Thanks for the memories, Erik! Alice Mary are you from my hometown of Hammond? I also shopped Goldblatts with my parents. I think the major reason for the disappearance of the cobbler is that modern manufacturing technologies have made it more economical to replace footwear than to repair them. A few years ago, I had a pair of workboots resoled and it cost me about 3/4 the price of a new pair. I wore them about 3 more months before the uppers began to come apart and I had to replace them anyway! Total waste of money. I was a regular at the shoe repair business in the last place I lived. I should check and see if I can find someone who does that here, in a much smaller town (yeah for small towns!). Thanks for reminding me. I am hard on shoes and am lucky if I can get a pair of hiking boots to last one year – the seams rip open. I do not like shopping for clothes and last year bought six identical 100% cotton, hunter green t-shirts and two identical pairs of jeans. I left the world of business dress behind more than ten years ago. Where I am not everyone wears jeans everywhere – yeah for cowboy country! Never visited a ‘cobbler’ … have done the cobbling myself on many occasions though; a sole to a favorite pair of shoes, sandals, work boots, hikers, or river footies may come loose; that’s what waterproof Gorilla bondo & half a dozen .99cent clamps are for! & I do the same thing with shoes & clothes, mostly when they r on sale/clearance. keep the next several sizes in totes in the basement or barn loft. When I was in school one of my very good friends uncle was a cobbler. Many of us would go to him during lunch recess to get taps on our shoes, 5 cents for the toe taps and 10 cents for the heel taps. They saved a lot of heels and toes. My dad did most of the shoe repair for our family, even though he was not a cobbler. I like many of the others responding loved the smell of the cobbler’s shop. The good old days were the best. I know that people have said that putting metal taps on their shoes was to save on shoe repairs, but I’ve always liked the sound the taps make, ever since I first discovered them in high school. I’ve found a number of ways of getting metal taps and even if the shoe repair place doesn’t have them, if you take them in, you can generally get them put on for you. I put my own taps on now, though. I like the larger ones on boots and loafers and smaller ones on pumps. I wonder if the Amish still put them on their shoes. Seems to me the frugality of you, and your readers, may be one of the reasons we are so drawn to the Amish. I, too, buy more of one article of clothing at a time, and wear it ’til it’s worn out.I am also able to patch, repair or darn almost any clothing. I remember in the 70’s having my leather shoes resoled. I loved the smell of the shoe repair shop. I’m not sure if the shoe repair shop is still open where I live. It remained in the back of the store when the shoe store closed and a consignment shop took over.I don’t believe the Hazleton area has an Amish shoe repair? I’ll have to check the saddle shop next time I’m there. And, I too, have also repaired shoes with Gorilla glue. Great stuff! You’re the 4th person on this thread Denise, sounds like Gorilla glue is worth trying! You are not alone, Erik! I always buy a spare of something I like! We have a small shoe/boot store locally that also does repairs. I’ve used him several times over the years for shoe repairs, but also for fixing broken pocketbook straps, backpack seams, coat zippers, etc. His heavy duty machines do miracles and his prices are very reasonable. I didn’t think this service was unusual – now I appreciate him even more! Hope he stays in business for many years to come. at Arthur, Illinois or Community Country Store, Kalona, Iowa. things to talk about in addition to clothes or shoes! Al for me visiting Amish shops is a bit more of an adventure–you find products you’d never expect to elsewhere, and in terms of a shopping experience it is the other end of the spectrum from say the mall I visited last Thursday. I too have a hard time finding shoes that fit so I have used a shoe repair shop many times. I have a pair of dress shoes that I’ve had for about ten years. I just keep getting new ends put on the heels. This might sound out of place for an Amish themed blog, but the best pair of shoes I ever owned was my military boots issued me when I was a teenager in the “Cadets” movement. If I kept them clean and polished they could get through just about anything I was asked to march through [maybe I’ll scrimp and save and buy a new pair, and trust me, “Doc Martin’s” are not the same as “army boots” issued by organizations like the Department of National Defense – DND). The second best pair I had was a Dr Scholl’s shoe that resembled my cadet boots, and next a pair that didn’t have a major brand on it, which also looked like the earlier mentioned pairs of shoes. I’ve yet to put my personal test to my “Bostonians”, but I’m afraid I didn’t like them because they didn’t have the toe I liked in my Cadets and Dr Scholl’s, plus I kind of want to keep the Bostonians nice instead of hiking and trudge in the mud in them as I sometimes do in the spring and summer. Once I was visiting Amish friends and an older daughter admired my shoes. A week or so later I received a letter in the mail from the daughter asking me to buy her the same shoes at my convenience. Rather than including her size, she drew an outline of her present shoe that fit well. It was funny going into the store to find a size match – the salesman gave me an odd look. My mom said that’s how they used to order by catalog. The shoes were a perfect fit. Our family uses Shoo-Goo to re-attach loose soles. It’s not so much a matter of hating to shop, but rather it’s just getting so hard these days to find things that fit properly – and especially shoes – that when we finally do we better grab a few because it’s guaranteed they’ll be discontinued before too long! In the old days they made things to last and therefore it was worth having your shoes fixed at the cobblers in order to get a few more years of wear. But today’s shoes and clothing ( made mostly in China ) are so cheaply made that they’re not worth trying to save. Do any of you women out there have the same trouble as me, finding the sleeves on all of the tops, blouses, and sweaters are way too long? The Chinese workers must be having a good laugh, thinking all of us Western women to be like big, tall Amazons with long gorilla arms! I’m also guilty of buying the same style shirt/pants/shoes in a variety of colors. I’ve lost a lot of weight recently and have needed to buy new clothes. I’ve tried really hard to buy different items. But…to tell the truth…it’s very difficult. Old habits die hard. And, Debbie, I find that the sleeves are not only super long, but REALLY tight. Crazy. Count me in on this. I, too, have been known to buy clothes and shoes in multiples of the same design. I detest shopping. I also frequent shoe repair shops. More people need to take advantage of this sort of thing, but too many of the younger people have been conditioned to live in a throw away society – even in this recession/depression we are now living in. I am agreed with you and facing the same problems. When I was a child, my parents would take their shoes to Pilcher’s Shoe Store in downtown Syracuse , Indiana for repairs. Pilcher’s closed many years ago. I don’t think Pilcher’s was an Amish business, though. Our family would buy shoes there as well. On a side note, whenever I read Ray Bradbury’s book Dandelion Wine, specifically the chapter where the protaganist is admiring and finally purchasing his dream shoes at the beginning of summer reminds me of those times spent in Pilcher’s. Yes, I’ve taken leather shoes many times over the years to shoe repair shops, both Amish and English. Usually only for very favorite and comfortable pairs of leather sandals that I can’t purchase anymore. 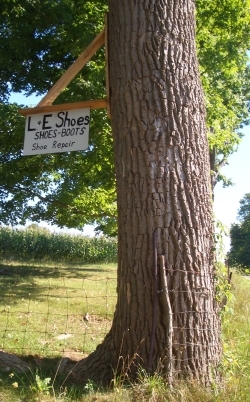 The Amish shops that repair shoes are really not just shoe shops, but usually primarily harness shops! They do shoe/sole repair and other leather repairs. My college-aged son has taken his favorite baseball mitt to the closest place to be restrung several times over the years as well. The businesses don’t always promote shoe repair and definitely don’t put out signs saying “mitt repair”, lol – you just kind of know around here that if it says harnesses or leather goods or something like that, you just go in and ask them if they do other things, too. Great tip Kerry. I wonder if they do car seat leather. I can imagine they’d have experience with baseball/softball mitts. I am super hard on shoes as my feet “roll” to the outside and most shoes will only hold up to that sort of abuse for a few months before they start breaking down. For the past twenty five years or so I have been buying Allen Edmund (hope that is how it is spelled) brand shoes. They are expensive and only a few stores sell them, so I have to go all the way into the big city to the east (Sodom & Gomorrah is what I call it, you might know it as Houston) to buy them. They are made somewhere in the Midwest, maybe Wisconsin, I think. Quality shoes, American made all leather box construction in the heel, they last for decades AND they have a repair shop (cobbler?) so when you send your shoes off for repair you get a shoe back that is like brand new, but is already broken in. I love them. In our little town we have a saddle / harness repair shop that repairs shoes & boots as well & that is where I take all of my work boots or shoes to have repaired or resoled. Kenny, the owner, told me recently that he is looking to retire but can find no one that is interested in buying his business out. I hope he doesn’t end up just closing it like has happened in small towns and big cities across the country. I learned to repair shoes from my grandfather. I have great respect for the traditions and craftsmanship in cobbling. I just wish that shoes had the same quality as they used to. They were easier to restore and seemed to last forever.